Aquatint is an intaglio printmaking technique, a variant of etching. Intaglio printmaking makes marks on the matrix (in the case of aquatint, a copper or zinc plate) that are capable of holding ink. The inked plate is passed through a printing-press together with a sheet of paper, resulting in a transfer of the ink to the paper. This can be repeated a number of times, depending on the particular technique. 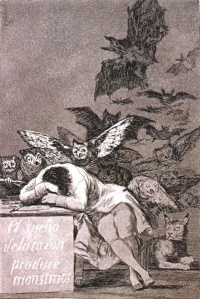 Francisco Goya famously took great advantage of aquatint printmaking, in his Los Caprichos series (1799); Los Desastres de la Guerra (1810–19); La Tauromaquia (1816); and Los disparates (ca. 1816–23). Master engraver Robert Havell used aquatint for John James Audubon's Birds of America (1826–38). David Hockney, known for his many paintings of the Los Angeles lifestyle in the 60's, has created a number of aquatints and etchings used with color in his "The Blue Guitar" series of prints. La Belle Assemblée, a British women's magazine published from 1806 to 1837 had many aquatint colored plates. Unless indicated otherwise, the text in this article is either based on Wikipedia article "Aquatint" or another language Wikipedia page thereof used under the terms of the GNU Free Documentation License; or on original research by Jahsonic and friends. See Art and Popular Culture's copyright notice. This page was last modified 08:50, 7 February 2014.